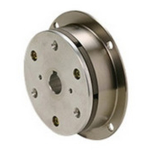 These models have unitized designs based on the 111-12 type of electromagnetic-actuated brake. They use two types of armature so they are shorter in the axial direction, thinner and more compact. Unitized construction allows one-touch mounting. This can greatly shorten mounting time compared to complex installations that involve with gap adjustment and calibration of concentricity and eccentricity. Being easier to work with, they have excellent cost performance.